The Festival of the Dhow Countries is an international film and cultural festival held in July on the islands of Zanzibar. Hosted by Zanzibar International Film Festival (ZIFF), the event showcases and promotes the myriad of film, music, dance, and other art forms from the historically trade connected “dhow countries’ of East Africa, India, Iran, Pakistan, the Arabic countries and islands of the Indian Ocean. Activities and events include music, theatre and dance performances, workshops and exhibitions. 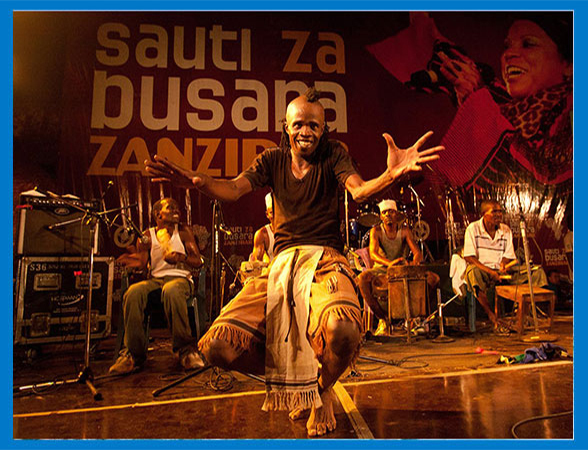 A large music programme also runs, featuring artists from Tanzania alongside international acts. Many of these events are staged at Forodhani Gardens and are free to the public. There are also workshops and seminars for women and children, and Village Panoramas, which reach about forty villages across the Zanzibar islands of Unguja and Pemba. Eid el Hajj is celebrated in February and marks the end of the pilgrammage in Mecca with festivities and carnivals held over four days. Festivities can be seen at the Mnazi Moja grounds, across from the National Museum, or at the Kariakoo fairgrounds. Mwaka Kogwa is celebrated in several villages around Zanzibar, but best observed in Makunduchi, on the southeastern coast. The colourful festival originates in Persia and celebrates the New Year according to the Shirazi calendar. Festivities are accompanied by ancient rites and rituals, such as symbolic fires and mock fights, which are believed to ensure peace and harmony for the village in the coming year. Men taking part in the fights, defend themselves with banana stems (in place of the traditional cudgels and clubs), while women stroll through the village dressed in their best clothes, taunting the men with songs about village life and love. The ritual is said to allow villagers to air any grievances and vent their anger, thus ensuring conflicts are not carried into the coming year. The celebration ends with feasts, singing and dancing, often carrying on late into the night. The International Triathlon and marathon is hosted in Zanzibar every November. In the past, events have proven successful in drawing competitors from Africa, Asia, and Europe. Both the Triathlon and Marathon are Olympic distances and take place in some of Zanzibar’s finest locations.